Facial redness that doesn’t go away? Inexplicable bumps and pimples? Irritated eyes? All are signs of rosacea, a potentially serious disorder that can now be diagnosed with more precision than ever before. April has been designated as Rosacea Awareness Month to educate the public on this often life-disruptive condition now affecting more than 16 million Americans – and most of them don’t know it. Beyond its immediate physical impact, new research has also found that rosacea may be associated with increased risk of a broad range of potentially serious systemic disorders. These include a growing list of cardiovascular, gastrointestinal, neurological and autoimmune diseases, as well as certain cancers. Despite its prevalence and damaging consequences, in a recent National Rosacea Society (NRS) survey of 1,459 rosacea patients, 47 percent said they had never heard of rosacea prior to their diagnosis, and 95 percent said they had known little or nothing about the condition. In other NRS surveys, 90 percent of rosacea patients said rosacea’s effect on personal appearance had lowered their self-esteem and self-confidence, and 52 percent said they had avoided face-to-face contact because of the disorder. Among those with severe symptoms, 51 percent said they had even missed work because of their appearance. Rosacea typically first strikes any time after age 30, and may initially resemble a simple sunburn or an inexplicable blush. Suddenly, without warning, a flush comes to the cheeks, nose, chin or forehead. Then just when a sufferer starts to feel concerned, the redness disappears. Unfortunately, it happens again and again, becoming more severe and lasting longer each time, and eventually visible blood vessels may appear. 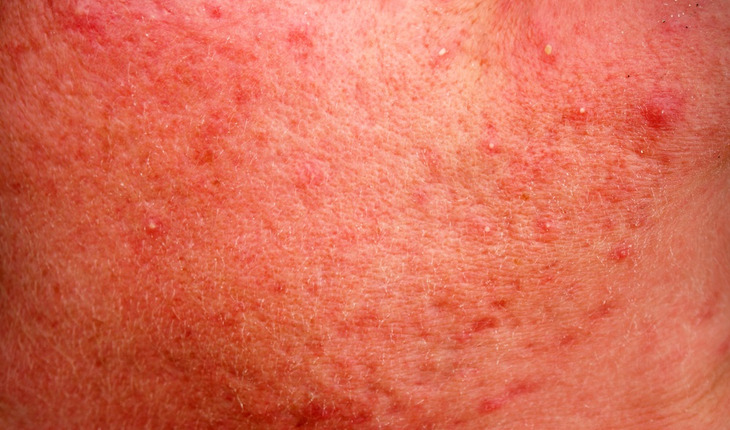 Without treatment, bumps and pimples often develop, growing more extensive over time; burning, itching and stinging are common. Recent studies have shown that the initial redness appears to be the start of an inflammatory continuum initiated by neurovascular dysregulation and the innate immune system. The role of the innate immune system in rosacea has been the focus of groundbreaking studies funded by the NRS, including the discovery of irregularities of key components known as cathelicidins. Research has further demonstrated that a marked increase in mast cells, located at the interface between the nervous system and vascular system, is a common link in all major presentations of the disorder. Other studies have documented a possible genetic component, as well as the potential role of the human microbiome. Although the ultimate cause of rosacea remains unknown, a vast array of lifestyle and environmental factors has been found to trigger flare-ups of signs and symptoms in various individuals. Common rosacea triggers include sun exposure, emotional stress, hot or cold weather, wind, heavy exercise, alcohol, spicy foods, heated beverages, humidity and certain skin-care products. People who suspect they may have rosacea can contact the NRS for more information; click here for the society’s website, or call 1-888-NO-BLUSH.